Performance Center by Smith & Wesson - Where fit meets performance. From hand-cutting and fitting to precise fine-tuning, Performance Center firearms are top performers. Originating from standard designs or created from the ground up, Performance Center revolvers, hunting revolvers, pistols and modern sporting rifles are the ultimate expression of old-world craftsmanship and modern technology. The 637 is lightweight, compact, easy to carry, easy to draw, easy to use and enjoys an excellent power-to-weight ratio. 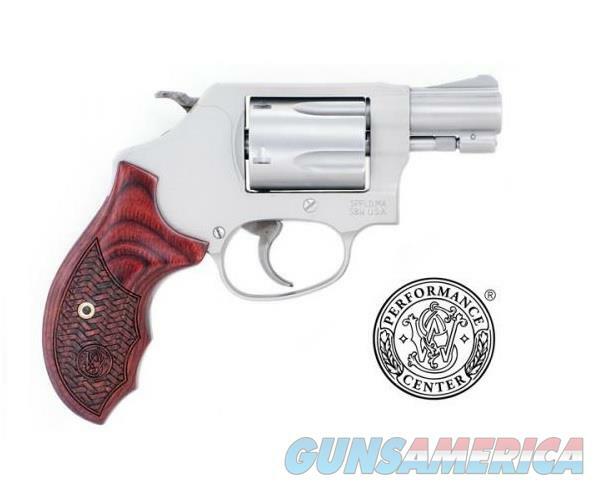 The revolver is outfitted with a 1.875" barrel and weighs in at just under 1- pound. Notwithstanding its snub- nose barrel, this revolver shoots remarkably straight. Since it's from the Performance Center, this Model 637 has been hand cut, fit and precision tuned. It has a set of checkered Custom wood grips.